Within every musical soul, there’s always an inner battle between security and creativity. Newcomer Jake McVey made the decision to walk away from a lucrative business designing and building custom guitars to pursue his dream. Instead of providing instruments for others to play music, he decided to step out and make his own. "It was a scary leap," confesses McVey, who just released his second album, ANYTHING IS POSSIBLE. "Everyone always wants security, but I always knew I was going to go this direction. It got to the point where I was doing a ton of shows and still working the day job. I always knew I was going to make music and somehow you just come to the point where it’s time. I bought a bus, sold everything I had, moved in it and went on the road." The decision has paid off as McVey has become one of the most in demand young acts in country music. Performing 300 shows last year, he was named one of the Top Ten touring acts by Billboard magazine. His experience encompasses a variety of venues from sold out clubs to opening for Martina McBride in front of a crowd of 22,000. 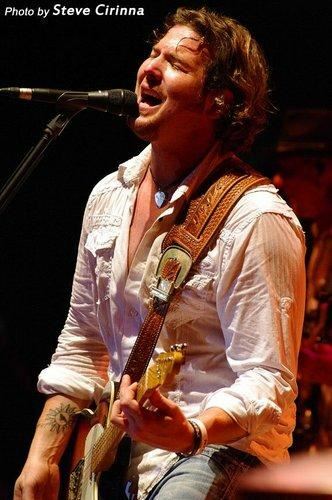 His high-energy stage show has earned the respect of fellow performers as he’s paid his dues opening for Dierks Bentley, Sugarland, Keith Anderson, Jason Aldean and Little Big Town, among others. This year he was booked for 10 consecutive nights at the Iowa State Fair. "I love to entertain, that’s my drug," says McVey, whose upbeat attitude and impressive work ethic are nearly as appealing as his fresh country sound. "I love people, the more the better. I don’t really get butterflies anymore. It’s just great to entertain and do what you love to do." Performing for fans all across the country is the fulfillment of a dream Jake had been preparing for most of his life. "My mom played piano and my dad was a drummer, so music was always going around the house," recalls McVey, who grew up working on is parents’ Iowa farm. "I knew at a young age that music is I wanted to do. Once I graduated, I moved to Phoenix to learn how to build guitars at the Roberto-Venn School of Luithery. Now most all of them---except one---that I play on stage are the ones that I built. When I first started and my tour schedule wasn’t so busy, I had my own little shop, but it started getting bigger and my goals were still here in the industry. I said ‘I can do this when I retire.’ I still build every once in a while for myself." McVey’s first CD attracted attention, especially with the singles "Unknown Highway" and "One of Those Days." Still McVey admits it wasn’t easy when he first hit the road. "I had to sell some of my prized guitars to keep things a float for a while," says McVey, whose high-energy stage show and skill as a guitarist has elicited comparisons to Brad Paisley and Keith Urban. "It was tough, but my approach was the old way of just taking the music to the people. And Of course, we’re Internet savvy and that’s helped too." His knowledge of instruments as well a wealth of performing experience that taught him what an audience wants coalesce on Jake’s new album. "Tone is everything that’s for sure," he says of carefully selecting the instruments he used on his latest recording. "I play a lot of lead, the Keith Urban thing instead of just strumming acoustic or playing rhythm. I’ll do that when I need to, but when I rip off a solo, I have as much fun as the rest of them. It’s a part of my life." A gifted singer and songwriter, McVey cites a diverse array of influences including Ray Charles, Stevie Ray Vaughn and Brad Paisley. "Instrument driven artists are the ones that inspired me a lot," says McVey, who writes regularly for www.guitarjamdaily.com. "Sometimes there’s nothing more powerful than just sitting on a stool and playing a song." Produced by J. Gary Smith, ANYTHING IS POSSIBLE is a potent collection of songs that explore life’s challenges and celebrate the triumphs. Mixing youthful optimism with a hard dose of cold reality, McVey’s music taps a universal current of emotion. On the Even Stevens-penned "Carry On," McVey’s warm, soulful vocal reminds us that "what don’t kill us makes us strong." It’s an emotional song that explores some heartbreaking scenarios yet still offers up hope. "I Want to Live Like That" is a thoughtful look at a life well lived and the things that matter most. "Times Like These" is a poignant ballad with an understated melody and a lyric that celebrates the cornerstones of life---love and faith. McVey also turns in a compelling version of the John Rich tune "I Pray for You," which serves as a perfect vehicle for his road-tested, emotion-laded vocals. "Any Road Will Get You There" boasts a catchy chorus and infectious melody, and McVey’s skill as a songwriter shines on "Maybe." The title track, "Anything Is Possible," was penned by Catt Gravitt and Carl Falk. "It’s just a good positive tune," says McVey, "and we got the idea of doing pay it forward things, kind of like the ‘Pay It Forward’ movie. When we go on tour, we’ll visit nursing homes or children’s hospitals before our show in that town and do a 45-minute acoustic show. It’s great. I’ve heard 90 something-year-old women who can whistle louder than I can. They are just having a heck of a time. It feels good to go into a town and give something back." McVey’s music has a sense of purpose and an ever-present element of fun. When he first embarked on this journey, he told his dad "failure is not an option." He bought a bus, hit the road and has never looked back. McVey embodies the title track to his new record and proved that with hard work and creative passion, anything IS possible. "It’s a lot of work," he says, "but it always does pay off as long as you have heart behind the wheel."